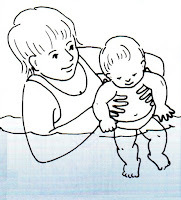 Here they are your Fully Detailed notes on Swimming Lesson Plans For Toddlers & Babies. Teachers will be able to use this fully illustrated reference to complement their current knowledge and parents will not only gain an understanding of what their current swim teachers are trying to achieve in the long run but may also supplement their existing classes by working with their children outside lesson time. The best ways that I have found to do each activity. The lesson plan itself is paced out for a 30 minute class with each activity displaying the time it is recommended to take. Hence adapting it for longer classes is simply a matter of adding an appropriate amount of time to each activity. I am confident that this is one of the most detailed lesson plans that you have ever seen. This is much more than one of those single page lesson plans that leave you guessing what on earth you are meant to do in each activity. I want to make sure that you understand the value I'm offering here at this introductory price. As I have said, this document is a summing of over 15 years of experience with baby and toddler classes. If I were to charge the price of a consultant, (don't worry I'm not but if I were to) I would charge up to $80.00 per student for a one-hour session. So let's be generous and say that I only had 1 student. Pretty unlikely I know but let's err on the conservative side. That means to teach this information to just 1 student, this document is worth at least $80.00. If this were a small book I could sell one copy of the swimming lesson plans for toddlers & babies for about $19.95 but I am not going to change that either. Although I may after the introduction. Now you can see that this there is a lot of value in this document. I'm going to sell it for the Special Price of Just $7 (USD). - After you pay make sure you click the "Return To Roper Enterprises" link to get your product (Roper Enterprises is my company).